The grind of New York City as gotten to you. You and your buddies have decided to play hooky in the park. Once you get there you realize nobody has brought any supplies. You need the essentials to enjoy the day. Remember this is New York so your team is not the only one looking for a fun day, of course you have to beat out teams for your items. 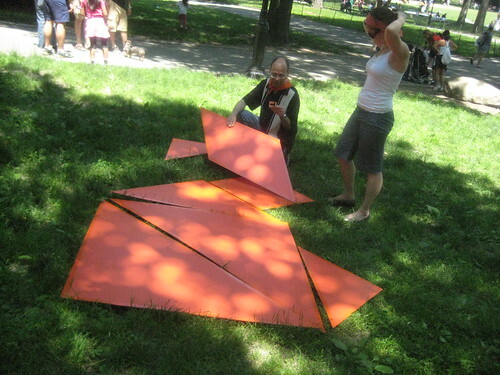 Each team will have to complete missions in the park, and solve HUGE tangrams to create their ideal Day in the Park . Part of the Come out and Play festival, city-size fun. Where can I purchase these giant tangrams? I am a dance teacher and my students need these for a piece we’re working on. I haven’t been able to find the right props, but these are perfect! If you have any insight, please email me at eshannon@nwacademy.org. Thanks!